When, where, and how often does the CCO rehearse? The CCO rehearses on Wednesday nights, from 7:15-9:45 p.m. (with a fifteen-minute break about half-way through the rehearsal) in the band/orchestra room (E-108) of Nicolet High School (6701 N. Jean Nicolet Rd., Glendale, WI 53217). You can download a PDF of directions to our rehearsal site here. When, where, and how often does the CCO perform? The CCO does four subscription concerts on Saturday nights in mid-October, early December, mid-March, and mid-May. 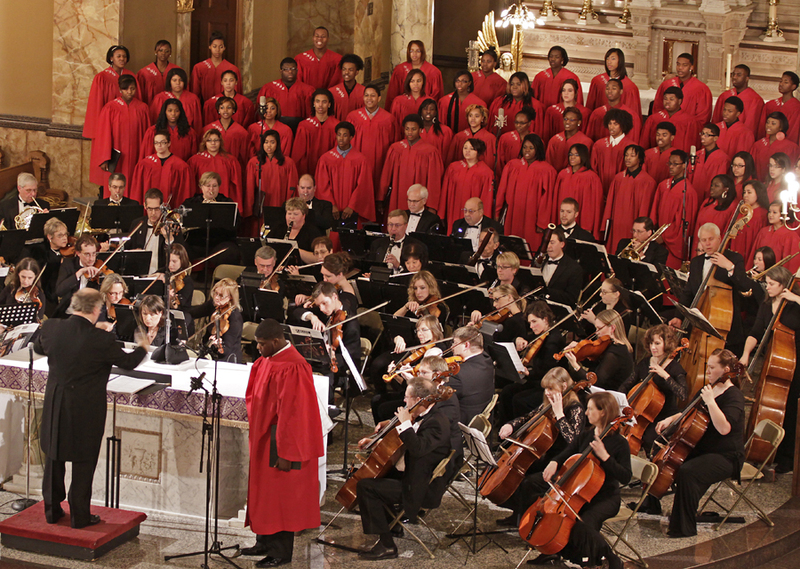 The October, March, and May concerts are held at St. Matthew’s Evangelical Lutheran Church in Wauwatosa and the December concert is held at the Basilica of St. Josaphat in Milwaukee. Performers from the CCO can also form small ensembles to participate in the chamber music sampler concert, held in January at North Shore Congregational Church in Fox Point. The CCO also performs several summer concerts at places and times determined by the concert sponsors. Past concerts have been held during June, July, and August at Boerner Botanical Gardens (Hales Corners), Nicolet High School (Glendale), New Berlin Library Green, and Franklin Legends Park. How does one become a player with the CCO? Membership in the CCO is based upon the needs of the orchestra. If you are interested in playing with the CCO, please contact either the General Manager or the Music Director and provide a brief summary of your musical experience and your contact information (e-mail and mailing addresses, and telephone numbers – a formal résumé is not required, but appreciated, if available). If we have an opening for your instrument, you will be contacted for an audition consisting of two or three pieces of music of your own choosing. If we don’t currently have an opening for your instrument, you will be added to our list of prospective members, and contacted should an opening occur. How large is the CCO? What is the CCO attendance policy? Although the CCO is a volunteer organization, members are expected to commit to attending regular rehearsals. Even if a musician has mastered his or her part, rehearsals are important as they enable the full group to work on ensemble – to fit all of the parts together to result in a unified and quality performance. All CCO members are expected to attend every rehearsal unless excused in advance. The Music Director or a member of the Board of Directors takes attendance each week. If you have an emergency absence (such as an illness) or a planned absence (such as an out-of-town trip) please contact the Music Director and inform him or her of the rehearsal(s) you will miss as far in advance as possible. Two excused absences are allowed before each subscription concert. Attendance at community concerts and dress rehearsals is mandatory unless excused in advance by the Music Director. Community concerts (free concerts at nursing homes or a similar facility) are held on the Wednesday before the Saturday subscription concerts in October, March, and May. Dress rehearsals are held on the Friday before the Saturday subscription concerts. Missing a community concert and/or dress rehearsal causes you to miss important preparation and information for the performance. Unexcused absence from a community concert or dress rehearsal may make you ineligible to perform at the subscription concert. If the Music Director feels you have had excessive absences, you may be asked not to play a concert. If you miss a dress rehearsal and the Music Director still allows you to perform, it is your responsibility to obtain any information you may have missed (e.g. cuts, bowings, dynamic markings, etc.) from your section leader and/or stand partner. Additional rehearsals may be scheduled if it is deemed necessary by the director. Please do everything in your power to attend! What are rehearsal expectations for CCO members? The Music Director makes every effort to make CCO rehearsals relaxed and fun, while still upholding professional standards and expecting intelligent and respectful behavior from the musicians. Maintaining focus on the Music Director and the music are the key factors. Arriving early allows you to chat with other musicians and to turn your focus toward the rehearsal at the appropriate time. Arriving late is a distraction to both the Music Director and other members of the orchestra. If a late arrival cannot be avoided, members should unpack and tune their instruments in the hallway to minimize disruption to other members. An occasional joke or “wise-crack” is also part of our rehearsal style. Conversations among groups of people during rehearsal or other sideline activities may be disrupting and should be limited to break time or before and after rehearsal. Questions and comments are a welcome part of the rehearsal process. There are times when instructions given by the director are unclear, there may be problems finding “where we are,” or you may even have a helpful suggestion. At such times a question or comment is completely appropriate. We request that members refrain from making critical comments about the playing of other members. Addressing individual members’ development needs is the responsibility of the Music Director. Questions or interruptions at dress rehearsals should be kept to those that are of critical importance. We rely on each member's courtesy and good judgment in these matters! What is my commitment to the CCO? Before each season begins, the Music Director tries to get commitments to specific concerts from as many musicians as possible. If your schedule changes or you find you have committed to a concert that you cannot play, please inform the Music Director as soon as possible. If you will be gone for an extended period of time, please make sure the Music Director knows about your circumstances and when you expect to return to the orchestra. This maintains your status with the orchestra so you can simply return to rehearsals after the concert(s) in which you will not participate. Likewise, if you plan to leave the orchestra permanently, please make sure the Music Director knows, in order to remove you from the e-mail list(s). What is the concert dress? MEN: Black shoes, black socks, black tuxedo or suit, white tux-shirt, black bow tie. WOMEN: Black dress shoes, black hose, floor-length black pants or dress or skirt at least two inches below the knee, and long sleeve black top with mock turtle, rounded, or v-neck collar (see this website for some good examples). FOR BOTH MEN AND WOMEN: The fabric, buttons, jewelry and other accessories should be subtle, so as not to attract undue attention. Please do not wear perfumes or colognes to rehearsals or concerts. For summer concerts, dress might be more casual at the sole discretion of the Music Director. If nothing is announced in advance, it will be formal concert dress. For community concerts, members should wear "nice" or "business casual" attire. How do we obtain the music? Every effort will be made to have the music folders available at least one week before the first rehearsal for each concert cycle. Folders are usually available to be picked up at Brass Bell Music (210 W. Silver Spring, Glendale, WI 53217), but may be mailed out in special circumstances. Music should be turned in, on the night of the concert, at a location in the concert hall determined by the orchestra librarian. ALL music must be returned; much of our music is rented or borrowed from other orchestras, and must be returned within two weeks of the concert in order to avoid additional fees. What are my responsibilities on concert nights? Please arrive at the concert site at least half an hour before the concert, to make sure you have sufficient time to warm up, make sure your chair and stand are where you expect them to be, put your music in order, and generally check to make sure there are no last-minute surprises. The warm-up room at St. Matthew’s (where you should also leave your coats and cases) is the choir room, in the southwest corner of the building (ask other members for help if you’re not sure where it is). At the Basilica, the warm-up room is in the basement. At both locations, it is not recommended that you leave purses or other valuables in the warm-up rooms. The Music Director makes every effort to begin the concerts promptly at the advertised time; if you have an emergency that may require you to be late or even miss the concert entirely, please call either the General Manager at 414‑750‑4404 or the Music Director at 414‑218‑2130. PLEASE DO NOT FORGET to turn in your music immediately after the concert! At St. Matthew’s, the music is usually collected in the warm-up room. At the Basilica, the music is collected at a site near the performance area, in a location determined by the music librarian. If you have had to miss a concert for any reason, please be sure to get the music back to the librarian as soon as possible! 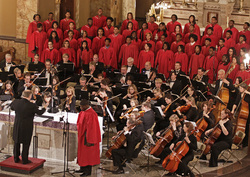 An informal reception follows each subscription concert held at St. Matthew’s. All musicians and audience members are invited to enjoy the food and beverages and mingle and celebrate a successful performance! What else can I do to support the CCO? The CCO relies on members to help spread the word about its performances. We encourage you to share our email newsletters, hard copy fliers, and other communications with family, friends, co-workers, and anyone else who might be interested in our concerts. The CCO’s aim is to make classical music accessible, so please also share the FAQs page, which can help first-time audience members anticipate what to expect and feel more comfortable. As a non-profit organization, the CCO also depends on donations, grants, sponsors, advertisers, and other volunteers (in addition to our musicians) to help at concerts and to serve on our board of directors. By sharing contact information for potential supporters, approaching local businesses to ask for advertising support, or otherwise reaching out, you can help the CCO continue to thrive!